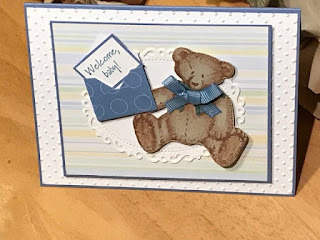 I made this card using a script background stamp, Make a Medallion from Stampin' Up, and Celebrate Thinlits from Tim Holtz. I think the design is great for a couple. When I make cards, I also like to include a matching envelope. The envelope is a standard invitation size bought at an office supply store. I die cut two "happy birthdays" and I used Stick-it paper to adhere them together. It strengthens the words and makes it easier to attach to the card. I hope you give this card a try. What are your favorite monochromatic designs?